Stanford scientists created an odd couple: a modified version of an immune-signaling protein and a coordinately modified receptor for this protein. The two bind only to each other, easing an advanced anti-cancer therapy’s side effects. Altering a powerful immune-signaling chemical plus its receptor on immune cells may bring a promising cancer treatment closer to the clinic, according to a study led by investigators at the Stanford University School of Medicine. If the advance proves as beneficial in humans as in mice used in the study, which was conducted in collaboration with researchers at the University of California-Los Angeles and UC-San Francisco, then incorporating it into the experimental regimen, called adoptive cell transfer, could speed that treatment’s acceptance as a standard anti-cancer practice. In adoptive cell transfer, immune cells called killer T cells are purified from a patient’s blood, endowed with superior tumor-recognition features via genetic engineering, and induced to proliferate. The modified cells are returned to the patient’s circulatory system, where they can efficiently and selectively destroy tumors. But this approach is hampered by the modified T cells’ failure to continue to survive, multiply and sustain their targeted rampage for substantial amounts of time after they’ve been transferred back into the patient. That’s because the altered T cells need frequent “booster shots” of a crucial protein called interleukin-2, or IL-2, just as natural T cells do. Garcia is the senior author of the multidisciplinary study, published March 2 in Science. The lead author is former postdoctoral scholar Jonathan Sockolosky, PhD. Produced naturally by various types of immune cells, IL-2 is secreted in response to various threats. When it binds to receptors on T cells’ surfaces, including receptors on the T cells secreting it, it spurs them to action. Deprived of this booster substance, once-active T cells become inhibited, exhausted and, ultimately, burnt out. This applies to the modified T cells infused into cancer patients, said Garcia, who holds the Younger Family Professorship. “These bioengineered T cells need IL-2 to survive, to work and to expand in number, just as our natural ones do,” he said. That’s fine when the T cells are outside the patient’s body. But strategies to boost the efficacy of adoptive cell transfer approaches by following up T cell infusion with intravenous IL-2 administrations have had major limitations. The reason is that the side effects provoked by substantial doses of the powerful protein — especially pulmonary edema — are so severe as to outweigh the advantages of the treatment. 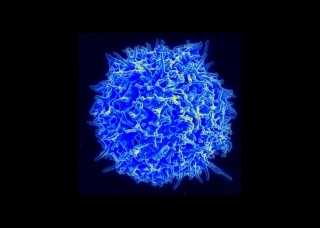 The problem is that receptors for IL-2 are found not only on T cells but other immune cells that are better left inactive during cancer therapy — for instance, so-called regulatory T cells whose job is to mute the immune response after the immune system has been mobilized against a tumor or invading pathogen. Failure of the immune system to stand down can spell constant tissue-damaging inflammation and autoimmune disease. Many other types of cells in the body, such as lung cells, also harbor IL-2 receptors, Garcia said, and IL-2 can induce damaging inflammation to the tissues containing those cells. But Garcia and his research group have found a workaround that should allow adoptive cell transfer to proceed without burnout — and without IL-2’s devastating side effects. “We engineered a slightly tweaked version of one of IL-2’s constituent subunits so that a receptor containing this subunit can no longer bind to IL-2,” he said. “And we generated a slightly altered IL-2 molecule that can’t bind to its normal receptor.” But the modified protein and modified receptor bind with high affinity to one another. Garcia credited Sockolosky for the meticulous matchmaking that paired up this auspicious odd couple. Using laboratory methods to snap the modified receptors onto T cells from mice, Garcia’s group showed in a series of experiments that these T cells responded to modified IL-2 exactly as natural T cells would be expected to respond to ordinary IL-2. But unmodified T cells didn’t respond to the modified IL-2 at all. Adoptive cell therapy is on the cusp of becoming a revolutionary new approach to cancer treatment. However, when T cells similarly bioengineered to attack the tumors, as well as outfitted with modified receptors responsive only to the tweaked version of IL-2, were infused into the mice and bolstered with regular doses of tweaked IL-2, they also shrunk the tumors — but without side effects. These mice’s survival was significantly improved in comparison with either untreated mice or those receiving adoptive cell transfer absent IL-2. Garcia said his group has now generated human odd-couple IL-2/receptor pairs that, like their mouse counterparts, bind only to one another. He is looking for collaborators in academia or industry to launch a clinical trial based on the new technology. And, he said, he believes the same approach, employed to stimulate regulatory T cells rather than killer T cells, should in principle be effective in combatting autoimmune disease. Bluestone and another study co-author, postdoctoral scholar Eleonora Trotta, PhD, are working on that approach at UCSF, Garcia noted. Stanford’s Office of Technology Licensing has a patent pending on intellectual property associated with this work. Garcia is a member of the Stanford Cancer Institute, Stanford ChEM-H, the Stanford Neurosciences Institute and Stanford Bio-X. Other Stanford co-authors are postdoctoral scholars Lora Picton, PhD, and Akanksha Chhabra PhD; PhD; basic life science research scientist Leon Su, PhD; life science research professional Alan Le; medical student Benson George; and professor of medicine Judith Shizuru, MD. The study was funded by the National Institutes of Health (grants R37AI051321 and R35CA197633), HHMI, the Stanford Cancer Institute and the Parker Institute for Cancer Immunotherapy.